40" Cablel! 120 Miles Recieption! Breakdown Price! Antennas Direct’s ClearStream Wi-Fi TV tuner brings DVR capabilities to your over-the-air TV receiver and streaming service. Best of all, there are no subscriptions or monthly fees. Solid Signal is your No. 1 source for the Antenna Direct Clear Stream Wi-Fi TV digital tuner. Channel: UHF21-69 for Digital Signals. Standing Wave Radio: ＜2.5. Receiving Range: 150 Miles. Cable Length: 10m. 1 x 4 200 Cable Ties. 1 x Matching Iron Clip. 1 x 18 18 135 Square Tube. 6 x 5 35 Screws. You are in the right place! 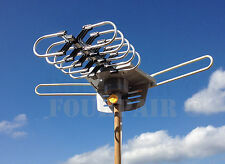 This 28-36dB 360° UV Dual-band Outdoor Antenna with Stand is a best choice for you. It is made of high quality material and advanced technology. It is of great connection, great tool, easy to operate. Trending at $28.96eBay determines this price through a machine learned model of the product's sale prices within the last 90 days. This Leadzm 10000 110V 40-860MHz 20±3dB 350°Rotation UV Dual-band Outdoor Antenna is a best choice for you. It is made of high quality material and advanced technology. It is of great connection, great tool, easy to operate. (1PCX Antena. just connect it to the TV and let the antenna do all the work. 1080p & frequency range (VHF(172-240Mhz) \ UHF(470-860Mhz). (1)Support 1080p. （4)Connector Type:F - head with TV adapter. （3)Coaxial Cable: 3.7M length. Let us help. When in doubt, ask the Solid Signal experts. This dish is made a for a single-feed-horn LNB. It will not work with a multiple-feed-horn LNB such as those used for DIRECTV HD or DISH HD. Max Rotation: 360 Degrees. Reception Range: 150 Miles. Typical Antenna Gain: VHF 28~32dB/UHF 32~36dB. Type: TV Antenna. 1 x Coaxial Cable 33 ft. Lightweight, compact and easy to carry. 1 x Power Box (US Plug). Clear TV Key by Clear TV works as long as you have power. -Sleek,slim design,can be hidden behind any TV,Plugs into Any TV. -Enjoy watching thousands of channels with your family in vivid HD & digital signals. Are you intending to find a high quality outdoor antenna dovetail guide?. You are in the right place. This 360-Degree Rotation UV Dual Bands 28-36dB Outdoor Antenna Install-free Guide without Stand is made of high quality plastic and aluminum material, durable and practical in daily use. Cable Length: 16ft. Amplified Power with the Signal Booster. Connect this antenna to the antenna port of your TV set. 1 x HDTV Antenna. The signal booster attaches to the end of the antenna to provide stronger signals. Reception Range: 200 Miles. 1 x Outdoor Antenna. With the light weight and compact design, it is easy for you to carry. It provides a good signal. Standing Wave Radio: ＜2.5. Plug Type: US Standard. Made of high quality plastic and aluminum material, durable and practical in daily use. Cable Length: 10m. 1 x 10m Cable. 1 x Antenna. 1 x Fix Clip(Without Pole). With the light weight and compact design, it is easy for you to carry. Receiving Range: 200 Miles. Standing Wave Radio: ≤2. Made of high quality plastic and aluminum material, durable and practical in daily use. Condition is New. The Dual-Tuner OTA Adapter for DISH Wally HD Receiver gives you the ability to integrate over-the-air channels into the on-screen program guide for seamless viewing. Integrates OTA channels into Program Guide for seamless viewing. 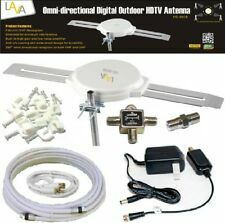 Use with HDTV Free Over the Air UHF VHF Outdoor Antenna, covering UHF bands channels 2-69 with FM Trap. AT-PAA28 is designed to reduce the signal loss due to long cable running. This Pre-amp is supposed to be installed very closely under the antenna, in most scenario, it is installed on the antenna master. Direct TV KaKu DSWM DISH SINGLE WIRE WITH DSWM3 LNB HDTV 4K LNB 13 tuners. 1 DTV 4 way splitter (Green Label). 1 DTV SWM power inserter PI21 (Green Label). Reception range is 150 miles. Reception Range: 150 Miles. 1 x Antenna. With the light weight and compact design, it is easy for you to operate. Standing Wave Radio: ＜2.5. Made of high quality plastic & aluminum material, durable and practical in daily use. Specifications: 1. Frequency: 45-860 MHz 2. Gain: 22-38dB 3. Rotation: 360° 4. Channel: VHF1-12 UHF21-69 5. Impedance: 75 Ω 6. Power: 3W 7. Power Supply: AC110V 8. Rotation Speed: 2-4 rounds/min 9. Remote Controlled Distance: ≤5m 10. Standing Wave Radio: ≤1.5 11. Model: TA-851B 12. Color: Silver 13. Weight: 38.80oz / 1100g 14. Material: Plastic & Aluminum 15. Brand: Leadzm. T shaped dipole antenna. Dipole Length (Two horizontal arms of the 'T'): 2.5 ft each. Connector: Male "F" Connector (as shown in the picture above). This antenna is ideal for all local FM receptions, including HD radio. 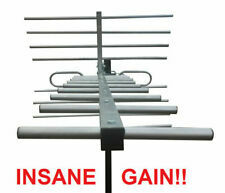 It's HDTV compatible and is Channel Master's highest-gain UHF antenna. The Channel Master 4228HD makes watching TV free and easy. Ditch cable TV and still get your favorite local news, sports, weather and network TV shows with an HDTV antenna. Connection: F Type Jack, VHF& UHF, 75ohm. The antenna and box will allow you to watch your favorite shows in full 1080p HD for free! 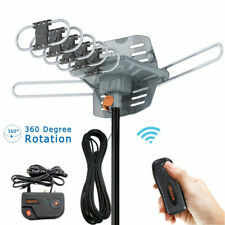 it is designed to receive Digital TV UHF/VHF signals and provides the highest quality HDTV picture available. Frequency Range: VHF 47-230MHz, UHF 470-862MHz. This Leadzm S108 100 Miles HD Digital Indoor TV Antenna is a best choice for you. It is made of high quality material and advanced technology. It is of great connection, great tool, easy to operate. The USB Digital Over-the-Air (OTA) Tuner allows you to connect an over-the-air antenna like a pair of rabbit ears or a rooftop antenna to your Hopper. This OTA dual tuner USB adapter is compatible with the Hopper family and Wally receivers. 4K ready 1080p. This a magic stick antenna for tv max 2 indoor /outdoors tailgating camping hd 16 ft. This DTV tuner box can be a great antenna tuner module for those LCD monitor or projector that does not have TV tuner built in. It is also a great add-on for those analog TVs or DVR systems. This digital TV tuner also supportsrecording of TV programs. Channel: UHF21-69 for Digital Signals. Standing Wave Radio: ＜2.5. Cable Length: 10m. 1 x 4 200 Cable Ties. Best match for your device. 1 x Matching Iron Clip. 1 x 18 18 135 Square Tube. 6 x 5 35 Screws. Are you intending to find a high quality open antenna?. You are in the right place. This Leadzm TA-101B 360°Rotation UV 45-860MHz 22-38dB Open Antenna is made of high quality plastic & aluminum material, durable and practical in daily use. Sometimes we are so accustomed to using the services of satellites and different TV operators that we do not turn to the most available source of TV entertainment: TV waves. There are numerous broadcast towers that broadcast available TV waves. A TV antenna is a way to catch these waves and translate them to your TV, and there are plenty of TV antennas to choose from on eBay. What kinds of broadcasts can the antenna use? Antennas are two types depending on the signal that they can capture. Satellite: Satellite antennas are made to catch signals that are broadcast from satellites. These antennas require the usage of dish antennas or a parabolic reflector that need to be aligned to receive the best signal from the satellite. Where can antennas be mounted? Antennas can be mounted two different ways, depending on where they are needed to be used. 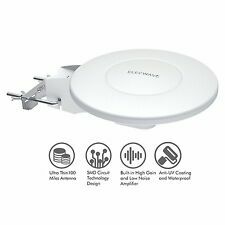 Both internal and external antennas are sold on eBay. Internal antennas are made to capture TV signals inside the home. They are required for homes that do not have a good mounting space outdoors. Outside antennas capture the signal easier than indoor antennas, but they are mounted outside and require longer cables. The internal antennas are appropriate for people who live within 15-20 miles of broadcast towers and have a strong signal. For those that are at a further distance, an outside antenna will usually work better. What is the frequency coverage in TV antennas? Frequency coverage is an important factor when getting an antenna. Countries that use VHF TV signals will require a VHF antenna. Most TV broadcasters today use UHF radio frequencies. Places that use UHF signals will require an antenna with a wider band acceptance or log periodic antennas. Digital antennas, on the other hand, are ones that capture more of the TV band used instead of receiving digital or analog broadcasts. What is the gain or directivity of antennas? One of the important parameters of antennas is the gain. This is the sensitivity that the antenna has towards specific directions. The higher the gain value, the better it is at picking up weaker signals. However, as the gain increases, the antenna must be more accurately directed to the correct direction of the TV transmitter. This makes the antenna less likely to be interfered with by signals coming from different directions than the one chosen. Gains are measured in dB or decibels. The higher value will show a higher gain.